Sam, I'm particularly impressed by the tall snowy white layer of bechamel on top. Very shallow of me to be so focused on appearances, I know! Φαίνεται ωραίος ο μουσσακάς σου! That looks wonderful. Very delicious. Sam, what can I say? I dance in the shadow of this Moussaka. A "stand-up" result, bravo sou! Oh, and PS: At our local farm/garden store I found the prized Greek oregano! We had to pick up a sprout and we'll soon have a healthy looking bunch. It smells wonderful. Nice blog... and the contents too. Hello there. My name is Theogr and I’m collecting recipe blogs. Have a look. I’m going to put yours on too. I very much like the effect of using 2 Pyrex pans :). I always fail at making a moussaka that keeps it together but hopefully your directions will help me the next time. wow that is one detailed recipe. It looks delicious. I've never had Moussaka. I just got on the greek food bandwagon and I'm not getting off. 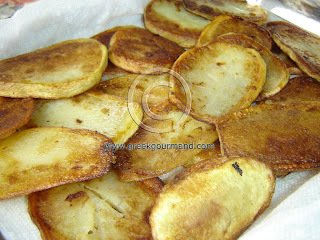 I absolutely adore Greek food! Glad I found your blog thru blogcatalog! Beautiful moussaka! I had to laugh at your statement re being picky about moussaka. We have a big fight every year at church when it comes time to make moussaka for the Greek festival. Everyone has their own opinion about how it should be done and gets pretty loud about it. No one agrees. Eventually people get disgusted and leave and the last knowledgeable person standing in the kitchen makes it their way. This happens every year, I kid you not! Beautiful recipe. I'll give it a try. I've gotten so used to quickly prepared food, I'm ready to cook something from scratch again. Lulu - No, no, not shallow at all. Thanks for the compliment! culinarytravelsofakitchengoddess - Yes it was, now it's your turn to give it a try. cj - Keep me posted, I would love to know how it turns out. Great to hear about the oregano as well, grow it and consume it in good health! theogr - Thank you, thank you! I would love to hear that you tried some of my recipes too! Lore - If my directions don't work for you, then I want to hear about it!!! ok? Sogeshirtsguy - Welcome Aboard! 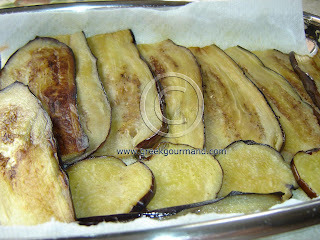 I am hoping you will give this recipe a try and let me know what you think of Moussaka. Cris - Thank you for the add! I think you would love Greece, so if you ever get the chance to go, don't think twice about it! Just do it. lisa - Thank you! Please do give it a whirl and let me know how it works for you. Thanks for stopping by and making your presence known, I look forward to hearing more from you in future. Sam, thank you very much for stopping by my blog. It led me to yours. You have a wonderful blog here! Great recipes, and very interesting stories. I love Greek food and we are lucky to have several Greek eateries near where we live although I am thinking the food I see on your blog is much better:) Homemade is always good. 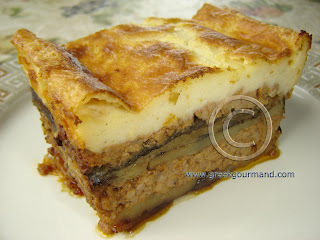 Mousaka is one of my fav dishes and I think I'll try your version next time I crave it:) It looks really good! I subscribed to your blog to receive your updates. Keep up the good work! Ok Sam, you will hear from me either way. thank you for the recipe. i will make this over the weekend since it is time consuming. thank you for the compliment on the rice pudding. It was in a Greek Restaurant where I fell in love with Rice Pudding. I will try this Moussaka one day. I heard Moussaka in My big fat greek wedding, a movie, and I thought it was a sweet dish. How surprise I was when I saw the ingredients. 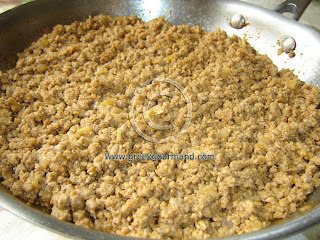 In the greek cuisine you use a lot of veal, I never tried it too. I'll use beef instead veal but I guess the veal is better. Yum, this looks really amazing!! A few days ago I posted a recipe for Musakhkhan (chicken baked on bread, Arab recipe), what do you think of clifford wright's idea that moussaka is derived from this word? Musakhkhan means to heat. Sarah, to be honest, I think much of what Clifford Wright has to say (what I've read anyway)about Greek food is rubbish. As for his derivation of the word Moussaka from the Arabic word Musakhkhan, it may be possible, though I would like to see his evidence. But, in any case, there is no dish like the Greek Moussaka in Arabic cuisine that I am aware of, so even if correct, his point is moot. My $0.02. I've been working on board a greek ship for seven years and really missing the taste of greek foods especially moussaka and pastitsio,I really love it.